After bringing a little human in to the world it's so easy to let your own self care completely fall to the bottom of your priorities. Before having children I could never understand why mums said that having a shower was a luxury and washing their hair was a near impossibility. Fast forward to a toddler and a newborn and I am now very much acquainted with dry shampoo. The juggle of keeping them both alive, safe and not sitting on eachother is a task that I haven't yet mastered to allow me to be in the shower long enough to wash my hair. But, it's so important to look after ourselves. I am a much more short tempered, snappy parent on the days when I haven't taken care of myself. The days when I don't carve out 5 minutes for a quick (but hot) coffee. Or the days when I'm feeling greasy and have thrown on yesterday's outfit with some suspicious sick coloured stains. Showering before my husband heads to work has become my go to. Or having a bath once the babies are asleep. Using nap times to sit and have a break, or catch a quick 15 minute shut eye are some of the things I've put in place to keep me feeling alive, a little bit more myself and just generally a kinder, more enthusiastic mum. I thought I'd share with you a few brands that are bang on the self care money. A few brands that are clearly run by mums themselves, who know what we need and how we need it. First up, The Mother Box, run by two mums Beccy and Alexis. I am lucky enough to have these two steller women in my life as friends. Beccy is a Doula and trained masseuse specialising in ante natal and post natal care. Alexis is a trained midwife and Hypnobirthing coach. They are two amazing women, both passionate about caring for women at what is often the most vulnerable time your life. They created the Mother Box as a simple way to nurture and care for women through pregnancy and beyond (say that in a Buzz Lightyear voice and it sounds much more exciting). They offer a range of boxes for during and after pregnancy. They kindly sent me a 'Brand New Mother' box after I gave birth to my daughter Nova. The box includes post partum healing bath salts, lactation flapjack, a beautiful scented candle from another fab mum run business Seven Seventeen, A booklet with lots of advice on healing and recovery, Nip and Lip soothing balm and lots more. I particularly loved the bath salts and took myself off for a gorgeous, relaxing bath for quite a few nights in a row. Heaven. The Mother Box is a fab gift idea. How much better to turn up to a friend's baby shower with one of these perfect boxes than yet another pair of baby leggings and matching hat. (as lovely as leggings and hats are!) I wanted to give an uncomfortably long hug to any friends that bought a gift for me rather than the baby. Because, in reality, the baby doesn't need a wardrobe full of newborn clothes, they only fit for a blink, but how much more would you appreciate a healing bath or nourishing herbal tea. 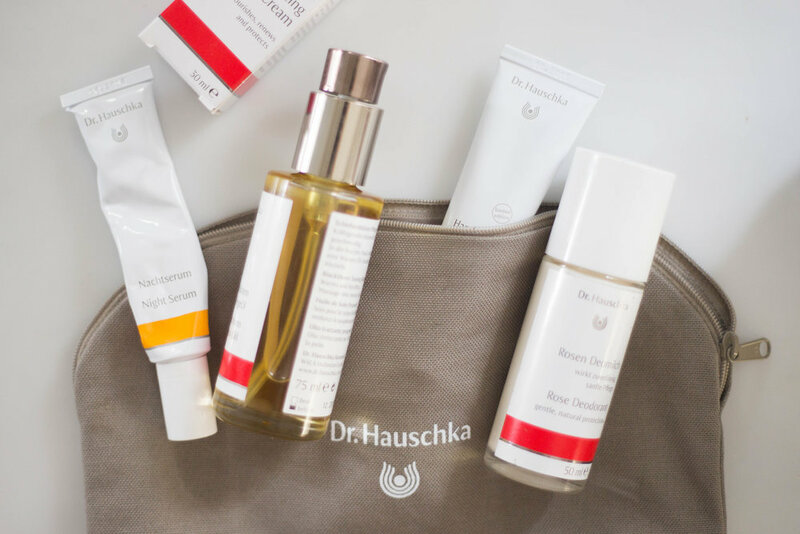 Next up is skincare brand Dr Hauschka. This brand just launched new Mother and Baby kits last month, created by a mum the kits are all 100% natural and certified organic. Fun fact (although actually quite a scary fact) Currently, for a beauty product to be labelled "organic", only 4% of its ingredients need to be so. To be certified organic by NATRUE, a product needs to be formulated with 95% certified organic ingredients. A pretty big difference! Dr Hauschka products are certified by NATRUE. I thoroughly recommend you have a quick read through their website, they are a genuinely inspiring company determined to find sustainable, environmentally friendly ways of creating safe, natural beauty products. I have been trying out the Just For Mum, Mum and Baby on the Goand the Bathtime Baby kit. Jet (my toddler) has quite sensitive skin, prone to dry patches and so I'm vary wary of what products I use on him. The Bathime Baby Kit has been fab, very gentle on his skin and a lovely peace of mind for me knowing that it is all natural and completely safe. The clue is in the name of the company but The Natural Mama Company have a great ethos: Caring for new mums with only ethically sourced products. The box includes the oh-my-goodness-softest-thing-I've-ever-felt reusable breast pads. I'm not gonna lie, I heard re usable and I cringed a little bit. The idea of reusing a milk sodden pad that had taken up residence in my bra for the best part of a day didn't overly entice me. But I have been completely won over. The pads are SO soft (as I already mentioned!) They wash really easily and come out like new and it is so nice to know you are doing your small part for the environment, not filling up landfill with your milk filled chuck away pads. Amongst lots of other bits, the box also includes a seriously stylish reusable Chilly's water bottle. Because what's sexier than staying hydrated AND caring for the environment? Can I get an Amen.